Edward by New Look ~ A classic look for men that is always in style. The Edward wig by New Look would make an excellent choice for men everywhere. Short layers sweep throughout your new hair, with a natural looking left side part adding style to your look. So soft to the touch, you’ll swear it’s your real hair and so will everyone else. You won’t be disappointed when wearing the Edward wig because of the high quality synthetic fibers providing the ultimate in comfort when being worn. Style the hair anyway you’d like, and create a look you can call your own. With the washable fibers you can truly treat the Edward wig exactly like you would your own hair. We make it easy to wear your new Edward wig. Simply take it out of the package we send you, give it a quick flick, and place it on your head. An easy process that won’t require long amounts of time in front of a mirror. We have taken wigs for men, and made them simple. Just like everything else men love. I just had to review this wig. I was skeptical of the quality due to the low price, but when I received it and wore it once, I couldn't BELIEVE how natural it looked, and it even feels natural! I drew more admiring glances than I ever thought possible the first time I wore it! I just can't believe that such a budget-priced mens' wig can be this good...how they can produce something so natural looking...and feeling....for such a great price. 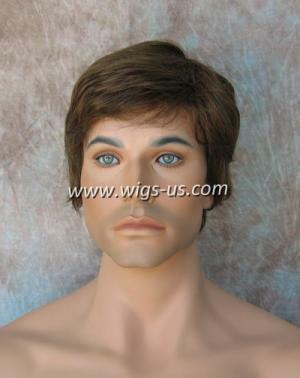 If you're looking for a real-looking and feeling men's wig, look no further!